There’s something special about being part of the community of Jeep owners. You don’t realize it until you start driving down the road and you get waves from other Jeep drivers. Jeeps have long been the cool brand of cars, and that’s not showing any signs of slowing down. Keep reading for the top 6 tips every Jeep owner needs to know. These will apply whether you’re driving a Jeep Cherokee or a Wrangler. What makes the Jeep brand special is the history of Jeep. That history continues on through the community of Jeep owners. Jeep’s history began in World War II. During that time, the War Department realized it needed a vehicle that was fast, nimble, could handle the terrain and replaced horses and motorcycles. American Bantam Car Company beat out three other companies to produce the first Jeep. It did so in 75 days and named the Blitz Buggy. The War Department liked the vehicles, but American Bantam didn’t have the capacity for mass production. The War Department took the original designs and handed them over to Ford and Wily’s-Overland Motors to encourage them to produce the vehicles. In 1941, both companies had their own versions of the vehicle. The War Department originally awarded contracts to all three companies. After each company created their own versions, the Department settled on Wily’s-Overland because it had the most powerful engine. Wily’s-Overland produced over 360,000 vehicles (called the Wily’s MB). The vehicles served many purposes, from transporting wounded soldiers to carrying supplies. They were used in every theater of World War II. Postwar, Jeep went through several owners. AMC, Chrysler, DaimlerAG, and Fiat. These ownership changes were due to buyouts, and each company recognized the value of the Jeep brand. Today, Jeep is a global brand and the 2018 Wrangler is one of the hottest cars of the year. 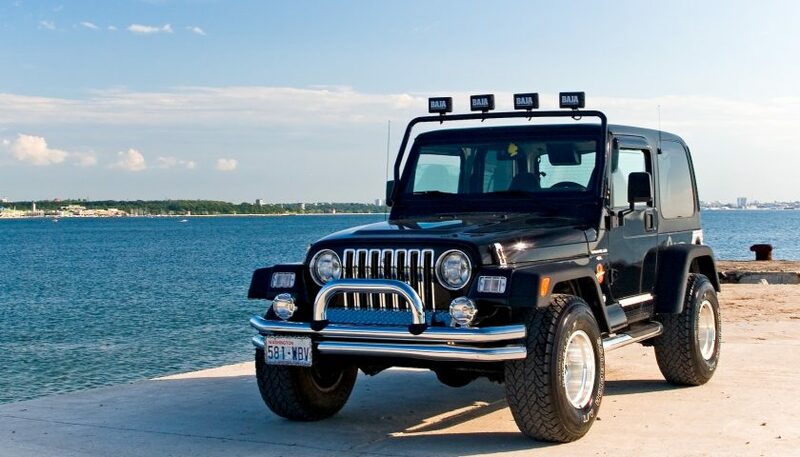 It’s connection with history, off-road handling, style, and options make Jeeps a great option for car buyers. It’s had a large loyal following for decades. What’s the Origin of the Jeep Name? This will arm you to take on any random trivia question about Jeep. Say “G.P.” three times fast, and you have Jeep. Now that you know how Jeep came to be, how can you make the most out of Jeep ownership? Take a look at these top 6 tips. The first thing you’ll learn about owning a Jeep is other Jeep owners will acknowledge you with a wave. There are some rules about Jeep models, who should wave first, the year of the Jeep. Don’t pay attention to them. As long as you wave, you’re good. Here’s the thing with the Jeep wave. It’s subtle. It’s a cool wave. With your wrist on the steering wheel, just raise your hand up and wave. You can give a nod to the other Jeep owner to acknowledge they have good taste in cars. Don’t panic, Jeeps aren’t built to fall apart. They’re dependable and reliable, but they also require a level of expertise specific to Jeeps. You’ll need the expertise especially for older models with manual transmission. With a sports vehicle that is taken out in rough terrain, there will be quite a bit of maintenance in your future. Some of it, you can do yourself. Other repairs will require a skilled mechanic. To find a good Jeep mechanic, start by asking other Jeep owners in your area. The great thing about Jeeps is that you can truly make them your own. You can add a tire well in the back or strengthen your springs for serious off-roading. You can wrack up serious credit card debt if you’re not careful. That’s why it’s important to plan ahead. Get a good idea of what you’re going to use your Jeep for, and get the appropriate accessories for it. It’s not enough for Jeep owners to wave at each other. There are clubs and gatherings to get into. Remember, you’re not a car owner. That’s for everybody else. You’re part of history by owning a Jeep. You’re part of a community. You can go to events like the Jeep Jamboree USA.You can also join the Jeep Owners Group and take part in local Jeep events. This tip is specifically for Wrangler owners. This can happen is any 4×4, but it’s common in Jeep Wranglers because of the number of upgrades and modifications that are possible. What happens is that they can throw off your alignment, and at certain speeds, your front wheels can wobble. That’s why you want to have a mechanic on hand who specializes in Jeeps. Getting all of those parts to work together isn’t easy. Jeeps owners are about having fun. Think about it, why else would you need a car that you can take through mud and other terrains? It’s fun! There’s a camaraderie among Jeep owners. That’s why you want to make it a point to go to Jeep related events. You’ll also want to carve out time in your schedule to take your Jeep off-road and test it out. Jeep owners are part of a loyal and growing community that’s been around for decades. MotorEra is a community for people who love cars. Whether you love to read about them, reminisce about great car models or restore them, this is a place for you. We have a treasure trove of repair manuals to help you restore or repair your car, and we have manuals for many models of Jeeps. Download the manuals for your Jeep today.